No. 83. Precast tunnel segments in fibre-reinforced concrete. With the publication of this bulletin, fib Commission 1 is initiating a new series of documents related to the use of structural concrete in underground construction, where structural concrete plays a major and increasingly important role. The usage of underground space is more than ever a key issue of urban planning and fib decided to start addressing the issues related to the design and construction of concrete structures in this particular environment. In this context one the most significant applications of structural concrete is tunnel lining, for which the properties of reinforced concrete are particularly well suited through compressive strength, water tightness, ductility, and durability. Reinforced concrete tunnels linings have mostly been traditionally cast in situ, but the development of Tunnel Boring Machines has lead to the invention of precast concrete segmental lining technology, which is nowadays one of the most promising applications of Fibre Reinforced Concrete (FRC). 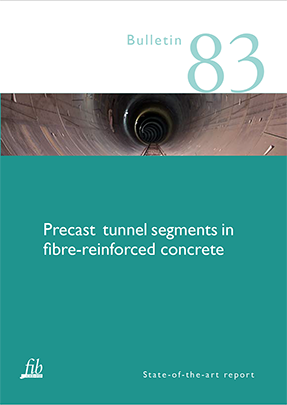 Thanks to the courage and dedication of innovative designers and contractors, a number of large tunnels have already been built around the World with FRC precast linings, and this report presents the experience acquired with these projects, and also provides guidance about the way to apply 2010 fib Model Code recommendations on FRC to these structures. The main drivers of this evolution from RC to FRC are a better ductility, more durability, and easier fabrication and construction process. As Commission 1 chair, I am very grateful to Alberto Meda and to all members of this task group for opening the way to this new field of underground structures within our commission, and to have efficiently produced a document that will be useful to our members and to the construction community around the World.